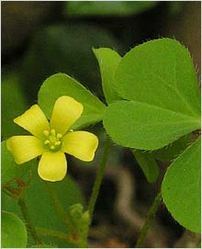 Habitat : Common in damp shady places, roadsides, plantations and lawns in india. Uses : Oxalis Corniculata plant is anthelmintic, anti-inflammatory, astringent, depurative, diuretic, emmenagogue, febrifuge, lithontripic, stomachic and styptic. It is used in the treatment of influenza, fever, urinary tract infections, enteritis, diarrhea, traumatic injuries, sprains and poisonous snake bites. An infusion can be used as a wash to rid children of hookworms. The plant is a good source of vitamin C and is used as an antiscorbutic in the treatment of scurvy. The leaves are used as an antidote to poisoning by the seeds of Datura spp., arsenic and mercury. The leaf juice is applied to insect bites, burns and skin eruptions. It has an antibacterial activity. Yellow, orange and red to brown dyes are obtained from the flowers. The boiled whole plant yields a yellow dye. An infusion of leaves is used to remove opacities of the cornea and is dropped into the eyes for itching lids. A decoction of leaves is used as a gargle.